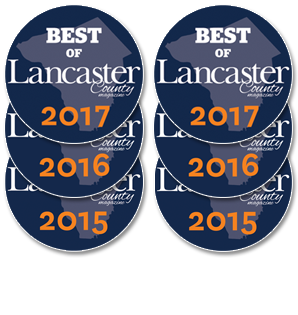 At Landisville Animal Hospital, you can be sure that your pet is in caring, capable hands. 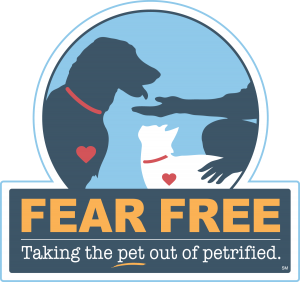 Here, you’ll find a team of skilled professionals ready to serve both you and your pet. Meet our staff. 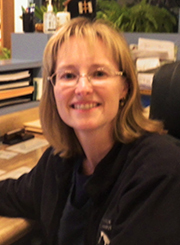 . .
Debbie started her career at Landisville Animal Hospital in August 1999. She worked as a full-time Receptionist for five and a half years until she started a family in January 2005. Since then she continues to fill in on a part-time basis. Debbie added a 2nd child to her family in March 2009. 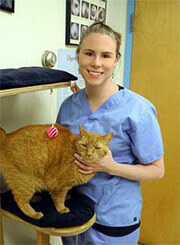 Alison started working at Landisville Animal Hospital in July of 2010 as a Receptionist and Veterinary Assistant. She completed a Veterinary Technology Distance Learning program through Purdue University, finishing in 2015. She is now one of our certified veterinary technicians. Alison grew up on a small family farm in northwest Ohio where she could always be found outside with one of the dogs, cats, or horses that resided on the farm. She now lives near Landisville with her husband Joe, who is a Dairy Veterinarian, four cats named Nermal, Lucy, Timber, and Seymour, and a rescue dog named Mona. Alison and Mona enjoy participating in KPETS activities, practicing agility, and spending time at the barn where Alison’s horse, Sam, is boarded. 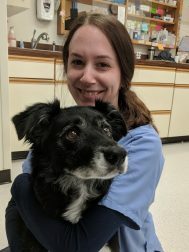 Jamie started working at Landisville Animal Hospital in 2003 after having her first dog, Caleb, go through multiple surgeries as a puppy and spent many days at LAH. She always had a love for animals growing up. She is married and has a daughter and son. Jamie shares her home with two cats, Mojo and Nitetime, along with 2 dogs Kayden and Rose. In her spare time she enjoys spending it with family and friends and enjoys being outdoors. Devon started off at Landisville Animal Hospital as an intern in February 2016. 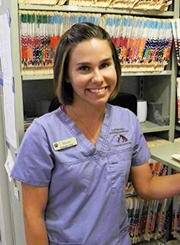 About 2 months into her internship she happily accepted a part time position as a veterinary technician. She graduated with an associates degree at YTI in April 2016 and is looking forward to many years to come working in the veterinary medicine field. Devon currently has 2 cats, Suki and Squall. She has a special place in her heart for cats, ferrets, and large breed dogs. In her free time she enjoys listening to music, drawing, hiking, and spending time at the horse barn. Heidi starting working at Landisville Animal Hospital in the fall of 1998. Since a young age she has had a passion for animals and is always up for the challenge of rescuing animals who are in need of a second chance. Heidi shares her home with her husband, daughter and several dogs and cats! In her spare time she enjoys spending time with her family and hanging out at the barn with her two horses. Mary always knew her calling in life was to work with animals. She worked with Standard bred race horses for many years. 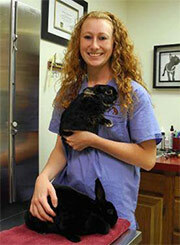 She graduated from the LCTCC veterinary assistant program in 2008. 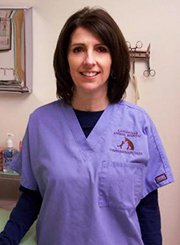 Mary was hired at Landisville Animal Hospital in June 2010. She has 3 cats: Stella, Willow and Stormy. Mary enjoys gardening, reading, and spending time with family and friends. 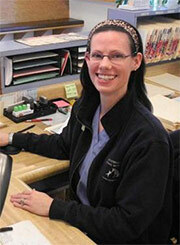 Rebecca started at Landisville Animal Hospital in October of 2012. She studied business at Elizabethtown/HACC. After two years of schooling, she realized her true passion was with animals. Starting at a kennel facility and working with rescued animals, she was introduced to the great staff at LAH. Rebecca is happily married to Ryan. They have two children and four pets; three dogs and a very spoiled Devon Rex cat. They all keep her very busy. She also enjoys being outdoors with her family. Leah started at LAH in 2012. She lives in Mountville with her husband Brian and their 3 children, Reed, Claire and Peyton. Another son, Hunter, lives in Enola with his wife Emily. Leah shares her home with two dogs, Moose, a Golden, and Grizzly, a chocolate lab. Both 9 years old. She enjoys going RVing and to Orioles baseball games. 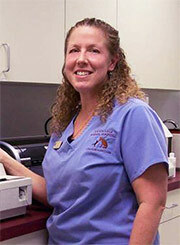 Wendy has worked at Landisville Animal Hospital for 13 years. She started out working part-time, while managing a local campground, but quickly realized that here is where she wanted to be full-time. Wendy had a passion for animals all her life, constantly rescuing hurt rabbits, birds and turtles then nursing them back to health. She volunteers with KPETS, a local animal therapy organization, to evaluate potential teams. Wendy has rescued many dogs and cats over the years and currently has 2 cats, Cameo and Smooch and 3 dogs, 2 Cocker Spaniels, Cadbury and Cinder and 1 Golden Retriever, Amstel. 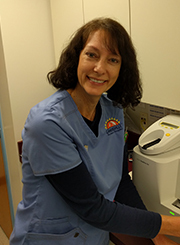 Wendy loves being part of the Landisville Animal Hospital team and feels so fortunate to have a special bond with many of the clients she has met over the years and looks forward to meeting many more. Karya started working at LAH in January 2014 as a part time vet assistant. In 2014 she became one of our full time assistants. Since then, she has moved from Elizabethtown to Landisville. She studied at HACC for 1 year to become an interior designer but quickly realized her true passion was animals. She enjoys the outdoors and traveling back and forth to Michigan to see family and friends. Currently she has 2 dogs to keep her busy, her lovable duo Lilly and Honey. In her free time she enjoys spending time with friends, spending time outdoors, reading and taking in what life has to offer her. Born into a farming family, Jenn’s love for animals started at a very young age. Although she did not attend a veterinary tech degree program, she is pleased to say she has learned from the best teachers here at Landisville Animal Hospital. Jenn joined the LAH team in January 2006. As with many others her technician duties advanced quickly and she soon expanded her jobs by becoming ” the fix it girl”. Behind the scenes she helps to keep computers and blood work machines functioning well. At home, Jenn enjoys spending time with her family and friends enjoying all life has to give. 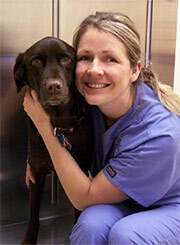 Amanda attended Wilson College and received her Certified Veterinary Technology degree in 1999. She began at Landisville Animal Hospital the summer of 1998. She is married and has two daughters. Amanda shares her home with two cats, Stachi and Cricket, along with an old English Bulldog named Beauford. In her spare time she enjoys time with her friends and family. Mary Oyola is an Anesthetic Nurse who also helps with appointments and the front desk. She obtained her Approved Veterinary Assistant degree at the Lancaster County Career and Technology Center in May of 2011 and continues her education in the anesthetic field. Mary has been with us since she interned in April of 2011. Her husband is Marco and her cat is named Pitter. She always says if it weren’t for her HOA she’d have a lot more animals. 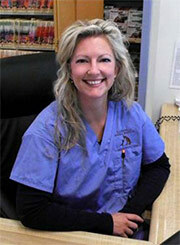 Mary is happy to answer any questions you might have when your pet undergoes surgery or a teeth cleaning. 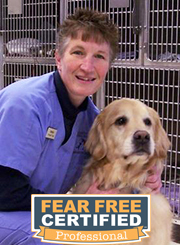 Terry is one of our Certified Veterinary Technicians. She earned her degree from Harcum College in December of 1993. She began her career with LAH in April 1994. After working full-time for four years, she and her husband Bryan started a family and now have three children; Ben born in 1998, Amanda born in 2001, and Lily born in 2004. Terry continues to work part-time as a Veterinary Technician and enjoys educating and interacting with our clients and their pets. Her home is shared by two dogs, Rosie, a Cairn Terrier and Libby, a Shih Tzu. Two cats, Karma (a rescue from outside her husband’s work) and Tipsy (who is deaf, and a gift from Alison here at Landisville!) There are also a couple birds…a cockatiel and a parakeet that showed up one day on the patio and a bearded dragon too. Liz graduated from J.P. McCaskey High School in 2003. She then attended Harrisburg Area Community college where she obtained a degree in Travel & Tourism and Hospitality Management in 2006. After working in the hospitality industry for 5 years, she decided to pursue her love of animals and attended the Lancaster Career and Technology Center where she became a Certified Veterinary Assistant in 2011. At home, she has 3 cats named Champ, Girl and Mama as well as a Border Collie Named Gia. Liz’s guilty pleasure is reality TV and she also enjoys traveling and spending time at the beach, even in the winter. Angelica has grown up taking her pets to LAH and began working as a Veterinary Assistant in the summer of 2014. She graduated from the Veterinary Technician program at YTI with an Associate’s degree in Specialized Technology of Veterinary Technicians, and was certified in 2016. Angelica has a dog named Pineapple, and rabbits, Casey and Finn. In her free time she enjoys spending time with her friends and going dirt biking with her husband, Zach. She wanted to work at an animal hospital since she was very young. In 2003 she started working at Landisville Animal Hospital as a receptionist. She is married and has two sons. She also has a Lab/ Shepherd mix named Sawyer and a Chinese Water Dragon named Puff, a rescued mixed Terrier named Norman, and the latest addition to the family is a bird. In Terrie’s spare time she enjoys taking walks with her dogs, sewing, quilting, and reading. Laurie worked for a local veterinarian for 12 years before “retiring “ to raise her three children. She re-entered the workforce in September 2015, doing what she loves, being a veterinary technician. 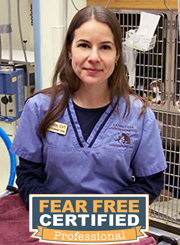 She eagerly joined Landisville Animal Hospital in September 2016 and has enjoyed working alongside the compassionate, professional, and dedicated team members at LAH to provide excellent veterinary care for clients and their pets. In her spare time she enjoys outside activities, especially going for walks with their dog and observing wildlife near the home she shares with her husband and kids outside of Manheim. She also enjoys spending time with friends and family and participating in activities at her church. Colleen started working at LAH part time in 2017, and became full time starting in 2018. As a little girl, she always wanted to help animals and dreamed of working with them, and that’s still true today. She currently has 3 cats: Aurora, Rex, and Carlos, as well as a bunny, Bugs, and they all manage to get along. In her free time Colleen enjoys spending time with friends, and going camping with her family at their cabin. New Clients Receive a. . .
From exams to surgery, CareCredit can make caring for your pet more affordable than ever!